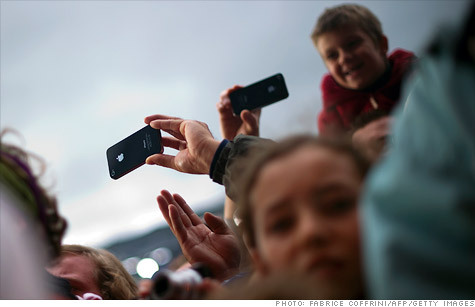 NEW YORK (CNNMoney) -- Smartphones are now more common than "dumb" phones. For the first time, more than half of all American mobile customers own a smartphone, according to a report released Wednesday by Nielsen. That's up from 38% a year ago. As smartphones eclipse "feature" phones -- the industry's term for phones without touchscreens -- the way Americans are using their handsets is changing. The number of apps downloaded to Apple (AAPL, Fortune 500) iPhone and Google (GOOG, Fortune 500) Android devices grew 28% over the past year to an average of 41 apps per phone. Smartphone users are spending 39 minutes per day using their apps, up 10% from a year ago. A Google study also released Wednesday found that 26% of U.S. smartphone owners would rather give up their computer than their smartphone -- a sign that the devices are truly becoming mini-PCs. Facebook, YouTube, the Android market, Google and Gmail remain the top five most-used apps, according to Nielsen. That isn't particularly surprising, since all of those apps except for Facebook are pre-loaded onto most Android devices, which remain the most popular smartphones. Android makes up 51% of all smartphones in the United States, compared to the iPhone, which has a 30.7% share, according to comScore. That trend has held up globally as well, with Android devices making up 56% of first-quarter smartphone sales. Just 23% were iPhones, Gartner reported on Wednesday. It's becoming evident that Google and Apple are running away with the smartphone market. They were the only major mobile operating systems to gain share over the past year -- and those that lost share fell hard, Gartner reported. Nokia's (NOK) discontinued Symbian fell through the floor. It represented 8.6% of overall sales, down from nearly 28% a year earlier. But the Finnish mobile company's replacement, Microsoft's (MSFT, Fortune 500) Windows Phone, also lost share. Microsoft's phones made up just 1.9% of sales last quarter, down from 2.6% a year earlier. Struggling BlackBerry maker Research In Motion's (RIMM) smartphone market share was sliced in half, commanding just 7% of sales this past quarter. Meanwhile, Nielsen found that the number of iPhone and Android users doubled in the United States over the past year. Globally, Apple and Google smartphones grew their market share by nearly 26 percentage points. They now control 79% of the market.